After a Rough 2018, Is Applied Materials' Dividend Safe? This chip equipment giant had a rough year, but that doesn't mean its dividend is at risk. This hasn't been a good year for shareholders of one of the world's top semiconductor equipment vendors, Applied Materials (NASDAQ:AMAT), as the company's shares are down nearly 40% since the start of 2018. Applied Materials develops and sells the complex equipment that's required to manufacture semiconductor products, including logic chips, memory chips, as well as displays. In recent months, however, we've seen several factors negatively impacting industry spending. These include elevated macroeconomic risks, global trade tensions, and specific to our industry, a pullback in memory investments. Recent commentary by memory makers has painted a consistent picture. Overall demand in the server, PC, and mobile markets is weaker than it was earlier in the year, and memory prices are softening in the near term. The executive did say, though, that its customers "expect demand to pick up and pricing to stabilize in the second half of 2019." If you're investing in Applied Materials for the long haul, there's a good chance you're wondering if the weakening demand situation puts the company's dividend -- which sits at $0.80 per share on an annual basis, yielding 2.49% -- is at risk. Here's why it's not. One way to analyze the sustainability of a company's dividend is to compare the size of the company's dividend on an annualized basis (dividends are generally declared on a quarterly basis) to the amount of free cash flow it generated over the last 12 months, since regular dividends are usually paid from a company’s free cash flow (I'm not counting one-time special dividends that involve a company returning a significant portion of the cash on its balance sheet to shareholders). As noted above, Applied Materials' dividend currently stands at $0.80 per share, per year. The company's free cash flow per share over the last 12 months was nearly $3.09 -- more than thrice where the dividend currently sits. So, Applied Materials' free-cash-flow generation is clearly more than enough to support the current dividend. Of course, you might rightly point out: "Isn't the stock down because management -- and, by extension, investors -- expect the business to come under pressure, thereby meaning that free cash flow could be on the way down?" That's a reasonable concern. 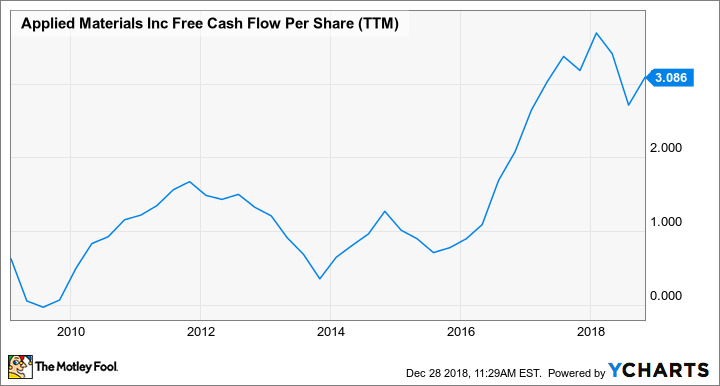 After all, if you look at Applied Materials' free cash flow per share trend over a longer period of time, you'll note that the company enjoyed a surge in free cash flow beginning in 2015. How can investors be sure that the company's free cash flow won't plummet back to where it was before the surge, thereby putting the dividend at risk? Well, the reality is that in the world of investing, there are no guarantees, and there are always risks. However, there are some potential indicators that things aren't going to completely fall apart for the company. Indeed, it's worth keeping in mind that Applied Materials doesn't only sell equipment to memory makers (which appears to be what investors are really worried about) -- it also sells equipment to logic makers and display manufacturers. On the company's most recent call, Dickerson said that "in foundry and logic, overall spending levels are strong, as customers optimize capacity at the current nodes, while concurrently pushing forward the leading edge." He added that "[in] aggregate, even with the current challenges I've described, overall wafer-fab equipment spending remains at consistently high levels" and that the company "still believe[s] that 2018 and 2019 combined spending will be around $100 billion," although he conceded that "[relative] to our prior view, we now see 2018 as slightly higher than 2019." Another thing to keep in mind is that analysts -- for what it's worth -- expect Applied Materials' revenue to drop by 11.4% in its fiscal 2019 before growing 12.6% in the following year. Earnings per share (EPS), analysts predict, will drop to $3.4 in fiscal 2019 (from $4.45 in fiscal 2018) and then rise back to $4.42 in fiscal 2020. Of course, things could change, and the situation could ultimately wind up being much worse than what Applied Materials' management and/or Wall Street analysts expect, but for now, it doesn't look like the sky is falling for the company. At the very least, it doesn't seem likely that the situation will get bad enough that the company's current dividend is in any real danger.